I love my breadmaker – it’s a few years old now but it has seen some good use over the years. I was given my bread machine as a gift and although it’s a fairly basic model, I’ve used it for all sorts of recipes. Making bread by hand is fantastic, but I’m not an expert and my results can be a bit hit or miss. My breadmaker consistently delivers delicious results, and it’s so easy to use! 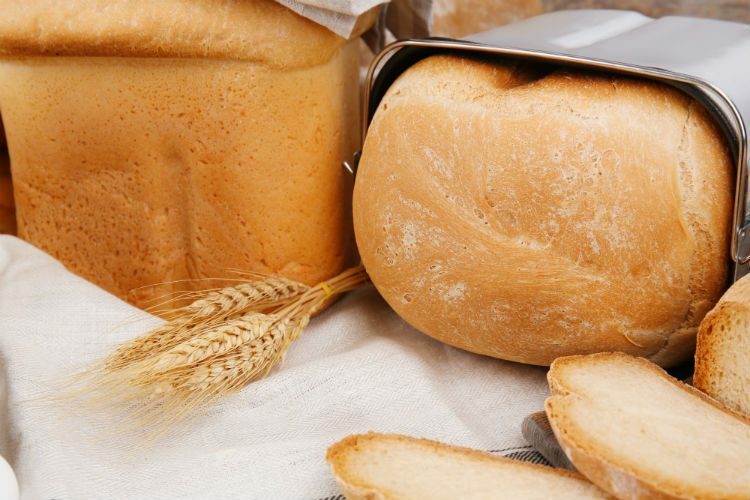 When it comes to favourite smells, freshly baked bread is right up there with the best of them. And fresh bread is always at its best when it’s straight out of the oven. But how many people have the time or inclination to bake bread first thing in the morning? Most breadmakers have a timer function which allows you to pop all the ingredients in the pan the night before. Then you can simply come downstairs in the morning to the glorious smell of fresh bread – yum!! On the other hand, my breadmaker rarely lets me down. The few mistakes I’ve had have been down to me using out of date yeast (note to self – check the dates!) or forgetting to switch it on (seriously!?). It’s much easier to make a loaf with a breadmaker! When I had my first breadmaker, it only made a handful of different loaves and they were all either white or wholemeal. Things have changed a lot, and today’s breadmakers can handle tricky speciality flours like Spelt flour or Gluten-free flour. They also have programs to make scone, sourdough and artisan loaves, so you’ll be spoilt for choice when deciding which loaf to bake next. And of course they will handle different loaf sizes and crust darkness, so you can bake a loaf to suit your exact tastes. If you add fruit in at the start of the process, it can get chopped up too much during kneading and you don’t get such great results. But luckily, breadmakers often come with a Fruit & Nut dispenser, so that the breadmaker can add in the ingredients at the best time during the kneading process. And the Panasonic SD-ZB2502BXC breadmaker has a yeast dispenser which is unique to the Panasonic Breadmaker. It drops in the yeast automatically at just the right time to ensure your bread rises as it should. This is is really useful if you are leaving ingredients in your bread machine overnight. Adding the yeast too early might result in it becoming activated too soon. Breadmakers aren’t just useful for baking loaves. You can also use them for baking cakes and even making homemade jams and compotes. Your breadmaker will usually come with a recipe leaflet which will give you lots of inspiration. I also like to use my breadmaker to make the dough, but then finish off the loaf by hand, or make bread rolls to bake in the oven. Or you could even make pizza dough in your breadmaker! Breadmakers can help you make an easy meal at a time that suits you. I love to make a hearty stew like my Chicken Cacciatore or cook a home made soup, like my Butternut Squash and Parmesan Soup, and bake a loaf of bread to go with it. With the timer function on my breadmaker, I can have the loaf ready just at the right time for when we want to eat. This is great for those hectic days when I know we’ll be out until late evening. Have I convinced you that you need a breadmaker yet? With plenty of breadmakers to suit all budgets*, you’re bound to find one that suits your family. Do you have a breadmaker at home? I’d love to know your favourite recipe to make in it. It’s absolutely gorgeous, the smell and taste are amazing! I love the smell of bread baking, probably because my Dad was a baker and I have grown up with the smell. I make bread a lot at home as well and is one of my families favourites when I do. We recently started looking for a bread maker for Hayden mainly as he’s allergic to egg, gluten and wheat. I had no idea Panasonic did bread makers. Glad we haven’t got one just yet. The Panasonic range look great, and using a breadmaker gives you so much more control over what goes into the loaf. Definitely great for intolerances and allergies! We used to have a breadmaker at home but never used it so I used to gaze sadly at it wishing I could smell the homely scent of baking bread. I would love to have one now but I do not have the space. Great post. Baking and I don’t go well together but doesn’t mean that I would rule out the possibility of getting a bread maker. I love the smell of freshly made bread and it always tastes so much better than the store bought bread. Mmm, there’s nothing better than the smell of freshly baked bread, is there?! Love it. We like to make bread in this house, but don’t own a breadmaker. They sound amazing, I didn’t realise they could do so much! Will definitely take a look at them. I have never thought of owning a bread maker until now. I will be checking this out. I have never made my own bread/had a breadmaker but there are all very good reasons to get one! I love fresh bread and it would be to amazing to make my own. I would love a bread maker! My friend used to have one and she would come in from work to the gorgeous smell of freshly baked bread! I love the idea of making my own bread but in reality I just don’t have the time :( would be lovely though! Oh gosh yes the smell of fresh bread! My mum used to have one and was always making loaves, I could never get to grips with it though. Oh I completely agree – you can’t beat freshly baked bread!